Eolia Beachfront Villa is a two-storey vacation residence with an enviable beachfront location. Although quite boxy in its architecture, the villa won’t make you feel boxed in because of its expansive garden that leads to the vast ocean. The villa’s layout may be compact but its indoor areas are spacious and airy. At Eolia Beachfront Villa, there’s truly more than meets the eye. 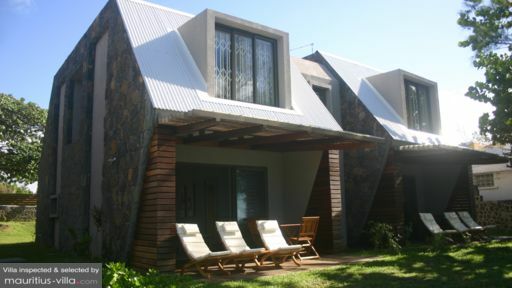 The villa has two bedrooms – both are on the second floor. One bedroom has a queen-sized bed and a view of the ocean through large windows. The other bedroom has twin beds and equally large windows that look out to the garden. Both bedrooms have ensuite bathrooms. The villa stands at the center of an extensive, well-kept lawn. Beyond the property is the white-sand beach and turquoise lagoon of Pointe d’Esny where you can – to your heart’s content – indulge in sea and sun. Even at the villa, you can continue enjoying both as you recline on cushioned lounge chairs out in the garden and take in the breeze and the view. Once it gets quite hot, you can take your place at the covered terrace and, perhaps, cool off with a refreshing drink. Indoors, right across the covered terrace is the living area. On its long and comfortable couch you can all gather for lively conversation. At the center of the spacious indoors is the dining area with a wooden dining table which can accommodate six. Here, you can sample and savor local dishes specially prepared for you by the in-house cook at the modern kitchen installed along the wall of the dining area. On certain occasions during your stay, you may also choose to dine at the picnic area out at the edge of the garden and by the beach. In charge of the villa’s maintenance and upkeep is a property manager supported by housekeepers and security personnel. A cook and laundry helper may, upon your request, be called in. Their services, however, will be charged separately. Bike and car rentals, excursions and shuttle services may also be made available to you. 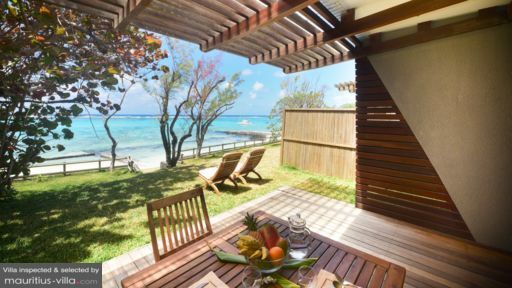 Eolia Beachfront Villa is located along Pointe d’Esny – one of the best beaches in Mauritius – at the southeastern part of the island. The fun begins right here through a variety of water sports – windsurfing, kitesurfing, stand-up paddling and canoeing. You can also go diving, snorkeling and fishing. 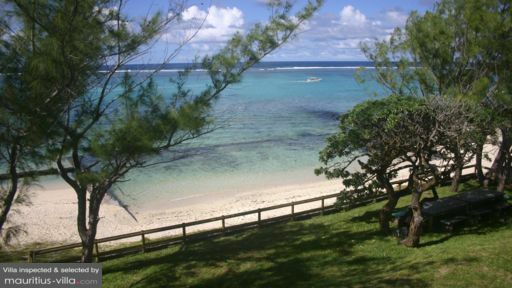 Head off to the Blue Bay Marine Park which is just 15 minutes away on foot. The beach also serves as the springboard to the nature reserve of Ile Aux Aigrettes.